Askat Kuchinchirekov is Asa the sailor turned herdsman in Tulpan. ‘Tulpan’ (‘Tulip’) is a young woman living on the desolate steppes of Southern Kazakhstan (the evocatively-named Betpak Dala or Hunger Steppe), 500 kilometres from anywhere. But we never see her – she exists only as the unattainable object of a young man’s dreams. Asa has been discharged from the Russian Navy’s Pacific Fleet and he is now back home on the steppe living uncomfortably with his sister and her family in a yurt and trying to work as a herdsman with his less than impressed brother-in-law Ondas. His only chance of advancement is to become a herdsman with his own flock, but this is impossible if he isn’t married. As the local sheep boss informs him “without a woman to wash and cook for you, you wouldn’t last a week”. Welcome to equal opportunities on the steppe! This outline suggests a classic neo-realist narrative, but actually it’s rather different. The (co-)writer and director Sergei Dvortsevoy is an experienced documentarist born in Kazakhstan in 1962 (in the nearest city to the film’s location). He had access to a €2.15 million budget and was able to shoot over a period of 40 weeks in the harsh local conditions. The cast are not ‘non-professionals’ but seasoned Kazakh performers (according to the very useful article on the film on the World Socialist Website) and unlike most neo-realist films, the simple premise doesn’t led us into an engaging social narrative. To be frank, not a lot happens out on the steppe but the minutaie of daily life certainly holds your attention and some of it contains real humour. The WSW seems to think that €2.15 million isn’t much of a budget, but it’s more than the budget of many UK films. It means that the Polish cinematographer Jolanta Dylewska (on this evidence one of the foremost women in cinematography and incidentally a professor at Lodz Film School), the (American? or Brit?) production designer Roger Martin and the (French?) sound designer Williams Schmit could fashion a very good looking and good sounding film. The sound is extraordinary from the dust storms of terrifying intensity through the very strange noises emanating from distressed camels and the singing from a young girl with a mighty pair of lungs. Dvortsevoy is clearly a highly-skilled observational documentarist and he creates a fiction from ‘real’ experiences. When you watch the film, there are various riveting scenes that you might think use special effects but the Press Kit suggests that they were all performed for real. We looked despairingly in the credits for “no animals were harmed during the making of this film”. I don’t think any animals suffered actual harm but there were some risks. The worry is that the film simply comes across as ‘exotic’ rather than a careful presentation of what is a real human story. I think it is the latter and I’m grateful for the WSW review which points to a couple of subtle asides which remind us that Kazakhstan is an ex-Soviet Republic awash in oil money but with a significant minority of the population who haven’t yet benefited from the new wealth. 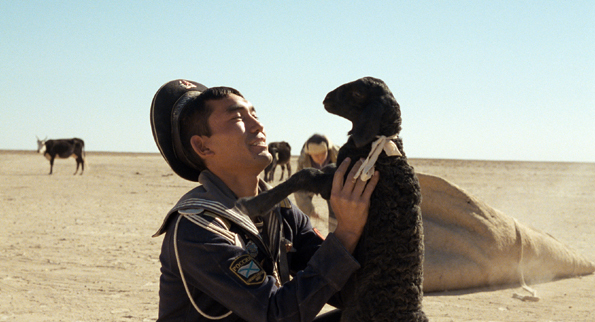 On the other hand, the US distributor describes the film like this: “Tulpan is a gorgeous mix of tender comedy, ethnographic drama and wildlife extravaganza set on the steppes of Kazakhstan”. It’s better than that. Like the earlier (and very different) Kazakh film we reviewed, Tulpan is a co-production with Swiss and German TV money and Polish and Russian facilities. Kazakhstan has a relationship with the European Audio-Visual agencies and this helps funding. This entry was posted in Russian cinema and tagged Kazakh Cinema. Bookmark the permalink.